When the Industrial Revolution forced country cottagers into the towns of North West England for work, they were obliged to set a basic meal cooking so they could eat when they got home. Irish workers escaping the famine and looking for work came in their thousands to the North West of England and brought their influence to local food. I have a huge respect for how people all over the world have done their best to feed themselves and their families with what was around them and survived against the odds with their own ingenuity. They used economical ingredients and nothing was wasted. With a world recession like we have had in recent years, maybe it is time to go back to the old traditional foods that kept people going centuries ago. I have chosen a few traditional foods from Lancashire, my birth location. The foods had to be very warming because of our climate in North West England. In a nutshell, warming, tasty foods developed out of poverty and climate. 2. Peel the potatoes and onion, cut the potato into thick slices, Boil the potatoes for 8-10 minutes. Cook the onions,, in the butter until soft, . 4. Bake at 180 degrees for about half an until golden, and serve immediately. 1. Put the onion and mince in a pan and fry for a few minutes, add stock and seasoning . Cook for 1 hour slowly add the cornflour mixed with water then add to the meat to thicken slightly cook another 10 minutes. 2. Place the flour, suet and salt in a bowl bind it with enough water to form a dough, rest for half hour in the fridge. 3. Roll out the pastry and make a square pie full of minced (ground ) beef mixture. Top with pastry. Lancashire hotpot is a dish made traditionally from lamb or mutton and onion, topped with sliced potatoes, left to bake in the oven on a very low heat in a heavy pot and so became a " hotpot "
Brown the meat and onions and layer in a dish, add barley if using.Place slices of potatoes on top and pour over the seasoned water and leave it to cook for over 3 hours on a very low heat about 140C. Cut out circles in the pastry and pout a spoonful of mixture in each one . Fold over to cover. slash the top to let steam escape. Sprinkle top with sugar . Lancashire Cheeses are my favourite cheeses. There are many local cheese farms making such individual cheeses as Parlick Fell, Inglewhites. The larger cheesemakers include Garstang Blue , Lancashire Cheese in 3 types Creamy, tasty Crumbly. Lancashire Cheese even features in Robert Louis Stevenson's classic Treasure Island where Ben Gunn who has been marooned on an island has craved for a Leigh Toaster, the traditional name for Toasted Lancashire Cheese. This is a type of blood sausage filled with oatmeal, barley, suet and meat. Bury in Lancashire is home to the best Black Pudding . In Lancashire it would be boiled. And for the very poor in South Lancashire, because nothing could be wasted, when the bits of cheese had gone hard and unusable, they would be chopped and slightly melted in a little milk with an egg dropped in and poached in the cheese mixture. This Lancashire cheese mix would be eaten in a bowl. Pan Hagertys are from across the mountains in Northumberland but this is a Lancashire version . Slice the potatoes finely and layer on the bottom of an ovenproof dish , layer the beef mixture on top and finish with a layer of potatoes. These little dried fruit pastries are traditionally eaten with a piece of Lancashire cheese to accompany them. 2. Put the flours into a bowl and rub in half of the butter . 3. Add enough cold water to make a stiff dough. 4. Cream the remaining butter with 1 oz sugar. 5. MIx in the grated citrus rinds and spice, then add the currants. 6. Divide the dough into 10 balls and roll each into a circle about 4 inches across. 7. Put a heaped teaspoon of the currant and spice filling in the centre of each circle. 8. Bring the edges together over the filling and seal them by pinching firmly together. 9. Turn the pastry rounds over and roll out to a round about 3 inches across. 10. Place on the baking sheets and score the top of each cake with a knife. Brush with egg white and sprinkle with some extra sugar. 11. Bake at 200°C / mark 6 for 20 minutes. Eat when cold . This is an 18th Century Lancashire recipe. Shrimps have been fished off the Lancashire coast for centuries. Put the shrimps in an ovenproof dish dish and cover with the butter mixture. Put a lid over the dish. Cook for 15 minutes. Put the shrimps in warmed jars and pour butter over them. Melt another 2 ozs of butter and pour over the shrimps to seal them. Put a lid on and refrigerate. Serve these with fingers of toast. These are pastries which were popular with the field workers and miners. They are filled with savouries and were taken to work and eaten cold. They are always eaten in twos and are never called " Lancashire Feet " it is always Lancashire Foots. Mix the bacon, cheese and onion and divide equally between the two foots. Turn the sides of the pastry up and gather at the top. Today I had a day out and saw this old Lancashire recipe for Wet Nelly. It is a moist tea bread and as with everything in old Lancashire was borne out poverty and not wasting anything at all. Wet Nelly hails from Liverpool, the land of The Beatles. Wet Nelly is a moist poor man's version of Nelson Cake hence it is called Wet Nelly. It is made from left over bread and pastry and soaked overnight to make it moist. Soak the bread and fruit in warmed milk for at least 4 hours or overnight. When soaked add the other ingredients and mix together. Pour into a greased deep sided tin. Bake Gas Mark 3 Elec 160C for 75 minutes until cooked. Here is a treat for welcoming the deceased souls, remembered at this time of year. Halloween. This was traditionally a ginger cake eaten on Hallowe'en. It is like a Parkin. Add the egg and then add just enough milk to make a smooth mixture and put it all in the tin . Cover the top with paper and bake for 90 mins. Store for 5 days before eating to allow time to mature. Lob Scouse came to Liverpool through Scandinavian sailors and the dish is known elsewhere in Old Europe as Lapskaus in Norway, Labskaus in North Germany, and Labskojs in Sweden. Whilst there are national variations all use carrot, onion and potato, just like Liverpudlian scouse Blind scouse has no meat, but is still scouse. It also has elements of the Irish Stew traditional and Liverpool is full of Irish people from over the water of course. The word Scouse became used to refer to anyone from Liverpool. Scousers as they are called . This is a traditional dish borne out of poverty and full of cheap, filling ingredients and what the poor of Liverpool had. It can be made with diced lamb or diced beef and is a favourite in our household. Put the meat, salt and onions in a large pan and cover with water . Cook for 1 and a 1/2 hours on low. Add the potatoes and carrots and simmer for another one and half hours . Leftover scouse was put between two slices of bread and eaten as a SCOUSE BUTTY. This is an addition that I recently found since writing the above. It is believed to be the traditional dish of the Lancashire witches and eaten at the Malkin feasts although my own feelings are that they would have been too poor to afford this. It is a layered pie with a shortcrust base infused with thyme . Put a suet pastry crust on top. Bake on high for 20 minutes or until golden brown. There are several versions of Everton toffee but this seems to be the one I preferred when sifting through recipes. Everton football club in Liverpool was nicknamed " The Toffees " after this delight. A cook named Molly Bushell invented it and it was usually eaten around UK Bonfire Night on November 5th. Cracknells were known as far back as the 15th Century and are a thin flat biscuit which was eaten with cheese. This is an easy recipe and could have several herb additions for flavour. Blackburn is a town in North Lancashire. Rub the fat into the flour and bicarb powder. Add salt and mix it all in. Add the warm milk and stir it all together. Roll the dough out thinly and cut into rounds. Last evening, a Lancashire friend asked me if I remembered these as a child. AND I DID. These were known throughout Lancashire and were usually given to children to fill them up. They are poverty food and show how nothing could be wasted in the cold and poor areas of the North of England. When bread was about a day old and not stale but not as fresh as it was, it would be broken into chunks and put in a cup with warmed milk and sugar poured over it. My friend recalls having this for breakfast. This would be pobs or pobbies. Similarly, if there were any meat juices off any meat that was eaten, chunks of bread would be placed in a cup and the meat juices were poured over. This would be lobs or lobbies. I wouldn't expect anyone to want to eat these now, but this is basic Lancashire food and shows Lancashire's ingenuity in feeding its children. If bread soaked in meat juices are eaten as a sandwich and not in a cup they are known as Dip Butties. Line a pie dish with pastry and spread the lemon curd over the bottom. Beat the butter and sugar together and stir in ground almonds . Beat the eggs and pour the mixture over the lemon curd. Bake 30 minutes or so at 180C, 350F or until cooked .Serve warm or cold. 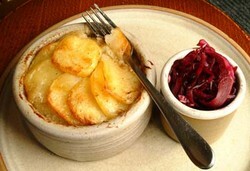 This recipe is from the Fylde coast in Lancashire and is considered to be linked to St Oswald. The Fylde area of Lancashire in the not too distant past celebrated the Tosset Feast where they had a local fair and people ate Tosset cakes. This happened around August 5th each year. Amblet of Cockles dates from at least 1764 and was in Elizabeth Moxon's cookbook. MIx them all together and brown them in a pan. Serve as a side dish. This " cake " is more of a pasty . It dates pre 1907 so ingredient quantities are not always listed.. Dried fruits pre soaked and mixed together. Make the pastry with flour, butter, sugar and egg and roll out. Cut into largish circles and place the dried fruit mix on half of the circle of pastry. Fold the other half over the top and seal the edges together. Bake in a hot oven until brown. This was always one of my favourite puddings at school dinners . There are several variations. I have chosen one. It is so easy and a huge favourite in Lancashire. When cool, spread some jam of choice over the base. Optional : slice bananas over the jam pour the thick custard / crem pat over the jam/ bananas and sprinkle with coconut. Leave to set and eat cold. I have added the Lancashire favourite, Manchester Tart, to the list above. I loved this as a child. Yes.I watched it too.marvellous … I was interested in the veg though .Lancashire mix of carrot and beetroot. I will try that. Maybe he will read this page. 28/9/2018. Tonight dancer John Partridge won Celebrity Masterchef [ on British television] by cooking traditional Lancashire recipes: starter,black pudding and scallops; main course, hotpot; dessert, egg custard tart. As far as I know, no-one has ever dared to present recipes from the unfashionable North West in a major cookery competition.John is a Lancashire lad through and through. Congratulations, John. You deserve your success! We North Western folk are with you. I have found a 1907 recipe for Balderstone cakes . It is an unusual Lancashire recipe that I hadn't heard of before. I have added it to the page. As cockles were not easy to transport and keep fresh this recipe would have been for people who dwelt near the sea. That is true but cockles were not the food of the wealthy in Lancashire so i would assume it was omitted. Cream was available on any farm. This cockle recipe contains cream and nutmeg, the latter being at one time very expensive, thugh it became cheaper as time went on. This was therefore to be seen as a recipe for someone with a bit of cash. By request ... a traditional recipe for cooking that Lancashire delicacy COCKLES . I have added it above. I have found an old recipe from Lancashire's Fylde coast for Tosset cakes and added it above. Foraged food might be blackberries, which are tasty even if you have sufficient supplies of staples, but limpets are not very nice to eat, though they are nourishing. I have used foraged blackberries, though I have never been sort of food, but I have never needed to eat limpets. Nestled next to the runway of John Lennon airport, Liverpool, and near the estuary to the Irish Sea, Speke Hall is a charming and beautiful medieval house and my favourite of all.